This week: New colors! Look for Bonfire, Portland, Cordelia, and more. Our yarn will also be featured at Knit Purl’s booth in a limited edition color, Rose City, available only for Sock Summit. 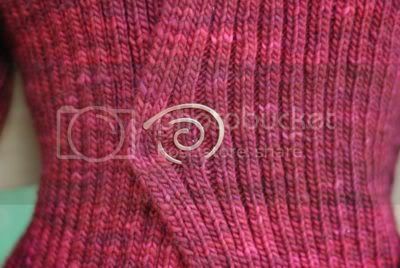 You can pre-order Rose City now at Knit-Purl.com. Come visit us at the Summit, we’ll be in booth 909. We’re also available online every day at AbstractFiber.com. This week: The Purl Girls are in Booth 818 with lots of glorious yarns to show you. There's Purl Up & Dye, of course, our own handpainted sock yarn. In addition to the three Dye For Glory colorways, we have tons of one of a kind color for you to choose from. We're also neck deep in Flat Feet from Conjoined Creations. Check out our beautiful rainbows! We have wheels on hand, too: Louet Victoria's and Ashford Joys, perfect for spinning your own sock yarn while you're on the go. Stop on by for special Sock Summit swag and meet the Knitmore Girls Saturday at noon! - Sock Summit: Aug. 6-9. Portland, OR. Come to our meet and greet- Saturday August 8th. 12- 1 we'll be in the Purlescence Yarns booth, 1-2 we'll be in the Abstract Fiber booth. Follow us on our blog, and on the Knotions blog! (See our tape measure picture here.) Follow us on twitter during the show! -Monterey Wool Auction: [Click on "Sunday"] August 16th, 12:30 PM. -PIQF: October 15-18. Santa Clara convention center. You can find the link to the listener map here. Come make your mark! Thank you for all of your reviews on iTunes. ALSO! If you leave your email address in the show notes (in the appropriate section), we'll be able to respond to your comments! Gigi continues to work on the dishcloth baby blanket. Gigi is also working on the Sidestream socks (by Cat Bordhi). Jasmin has been inspired this week! She has cast on the Picovoli shell, and she is using the Purespun Silk (by Pigeonroof Studios) in "Fatale". Gigi is working on her Scandinavian socks (from the Little Box of Socks) during her lunch break. Jasmin finished the first Black and Tan Sock. Inspiration has struck Jasmin like a Mac Truck, and it's called the Carnaby Street Pullover. Jasmin is planning to spin the yarn for this sweater, from a sheep named "Duchess" from Jean Near. The pictures of Jasmin and Gigi's knitalong sweaters have been posted in their respective threads. Gigi and Jasmin discuss "Jenny Check"-ing - over packing knitting and yarn for travel. We recommend packing one main project, and one backup project for short trips, and the same thing PLUS your interchangeable needle kit if you're going to a knitting event. In the event of enthusiastic shopping, Jasmin also recommends shipping your laundry home, and bring your haul back in your suitcases. Gigi is nearly complete with her On the Vine scarf- which has dyed her hands blue. Gigi underestimated the necessary amount for the border on her dishcloth baby blanket. In her haste to finish a sock (to cast on it's mate), Jasmin makes herself carsick. Gigi decided to cast on the Sidestream Sock. The Bosnian toe foiled her. Jasmin talks about donating blood, and how it's impossible to knit while giving blood. Jasmin, Gigi, Erin have a chance encounter with Garnstudio/Drops' dad. Jasmin reviews Shipwrecked! (at Shakespeare Santa Cruz), and they talk about the need for arts/theater. Jasmin recommends calling your local box office for bargain tickets. I thought you should have Iceland on your listeners map. I listen to your podcast religiously and love it every time.